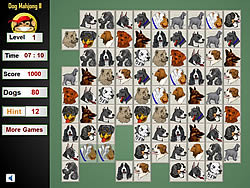 Connect same tiles with Dogs to Complete 10 different levels.Use your mouse to clear each of two similar tiles with dogs. Use the hint and get a clue. If you do not use the button to get more points. Tiles must be removed to each other, or they will be joined by a line with only two 90-degree angle.